Ever Wonder About The 1/16th In Our Logo? It’s pretty common that a business would put quite a lot of thought into their logo, colors, and branding. After all, this imagery is often the first representation of who we are to the rest of the world. I know that I have based my initial opinion of a company solely on their logo. While this may seem like a flippant and shallow practice, I assure you that I am not alone. It may only be a first impression, but it can make or break one’s decision to investigate a company further…or not. A strong and meaningful logo can go a long way towards instilling the proper message or “feeling” that you’d like the logo’s viewers to be impacted by. We actually struggled with the name of our company and its logo. We knew that we needed to send a very clear message and that we would only have mere seconds to do so visually. As for our name; it truly is a matter of trust in our opinion…this relationship between us and our clients. It is the premise and the one necessary ingredient for us to be able to effectively work for our clients. The “Workz” is an action word that we very much believe in. You see, we are not a widget company; we don’t peddle software or dashboards for others to make use of. While we do use software and technology…super-professionally I might add, we are a company made up of people who work for other people. The “Z”? I honestly just thought the different spelling and use of my favorite letter would grab attention. As for the gear, this again is an action item. We’re always turning, always working, always striving to be a useful component to each other and to our clientele. All of TrustWorkz® is a company and we are all but separate and important pieces working as a whole to accomplish our mission. 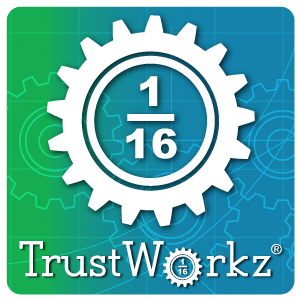 Just as a side note, I wanted to point out that in all of the logos I have designed for myself and for others since art school, the TrustWorkz® logo is the only one to become a federally registered trademark through the United States Patent and Trademark Office. Our core services are provided by skilled and empathetic individuals who are responsible for the management of our client’s entire web presence. These “web operatives” (WebOp®) only handle a limited number of clients in order to deliver the most effective results. A WebOp® can have no more than 16 clients in their portfolio. This decision was made as TrustWorkz® was launched and is a foundational tenet established to insure that we deliver the best service possible. So there you have the whole story behind our name and our logo. I hope that it sheds a little light on who we are as a company and what we set out to accomplish each day. It pleases me to no end that our name and logo still perfectly represent us after much water under the bridge and evolution as an organization. I would go as far as to say that our name and logo have kept us grounded and mindful of our mission.